As you can clearly see from this graph, the middle class has been trending in the wrong direction, regarding its share of national income, for over 40 years now. If you are at least over 45 or 50 years old, you may recall a time when a one income household (usually headed by a male breadwinner) could adequately, even comfortably, provide for itself. My father, for example, was a factory worker his entire life in Bridgeport, CT. With a sixth-grade education, and a lot of hard work, he was able to support my mom, my younger brother and I until I moved out of the house in the 1980’s and began to support myself. By that time, (a bit earlier, actually) my mom had gone back to work as well. My dad worked in a union shop and received a fair wage for hard work, as had his parents’ generation before him. I, too, worked for a couple of years in a union shop. The Teamster’s Union negotiated wages and contracts for us at UPS in Stratford, CT in the early 1980’s. When I started working there (loading and unloading trucks) I was earning about $10.00 per hour. Even in Connecticut, that was a pretty nice wage for a kid just out of high school. Within about a year, I was earning around $12.00 per hour, shared an apartment with a friend of mine, bought a car, and was able to save a little money. It should be noted that UPS was enjoying prosperity in those days as well, despite the presence of labor unions in its midst. In the late fall of 2011, a month or so before Christmas, I thought about making a little extra money down here in Greenville, S.C. where I now live. My wife is the primary breadwinner in our family, but I like to work, so I thought, just for the hell of it, I would check out what UPS here in the greater Greenville area was paying its employees for the same job I used to do around thirty years ago. It turned out their starting wage, in a non-union facility, was around $8.00 per hour. Now, adjusting for thirty years of inflation, I can’t even imagine what this “modern” wage would have equated to thirty years ago. Now let’s turn to Major League baseball for a few minutes to see how the ball players, represented by the Major League Baseball Player’s Association, have fared over approximately that same time period. As you can see, the players, represented by a very strong union, have become wealthier than they probably ever could have dreamed of just forty years ago. Alex Rodriguez of the New York Yankees will earn $28 million dollars this season. Derek Jeter’s net worth is around 125 million dollars. Now, obviously supply and demand is an important factor here. As long as baseball remains popular, the money will be there to pay this select group of highly talented athletes. But it’s equally important to remember that baseball has been a capitalist enterprise for well over a century now, yet ball players have not always grown rich, and least not this rich. The minimum salary for a player (his contract negotiated by his union) is now over $400,000 dollars, around ten times the average salary of a non-union teacher here in South Carolina. I am not making an argument over the relative fairness of what a teacher makes vs. what an athlete makes. Great teachers are rare, but so are great athletes. Still, children understand and respond to incentives just like the rest of us. What choices are we encouraging our children to make based on the incentives available to them now and in the future? The primary arguments I’ve heard from people (some of whom haven’t earned a middle class wage for years) against unions is that either A) Unions are corrupt, B) Union workers are greedy, or C) We can’t afford them. Let’s take each of these three arguments as they relate to baseball. A) Unions are Corrupt: There’s no question that the Player’s Union hindered the development and implementation of any rules regarding testing for steroids. One reason for this was that they believed protecting a player’s privacy was an important consideration. How could they be sure this wouldn’t turn out to be a witch-hunt? In that regard, they turned out to be right. The so-called confidential list of players who tested positive was partially leaked to the press, then on to the public. From that point on, all players have been branded guilty until “proven” innocent. Many of the Hall of Fame voters themselves seem to be waiting for “more information” regarding players they suspect might have used PED’s. Perhaps more names from another “confidential” list will someday illegally be made public. Then, with illegally obtained information at hand, they can penalize still more “dirty” players. Sure, there are other kinds of corruption. These kinds also exist in non-union corporations, and among many of the Congressmen on Capital Hill, some of whom feel the need to remind us of the corruption of unions for political purposes while finding loopholes around and through the rules in an effort to enrich themselves at public expense. Public sector employees are also often accused of being greedy, despite the fact that they often earn less money than their private sector counterparts who have similar levels of education and job experience. My first year as a teacher, in a small town in rural Maine, I earned $20,900. That was in the mid-1990’s, not all that long ago. In my final year as a teacher, after a dozen years of experience and 36 Master’s Level college credits, I was earning $49,000. A friend of mine who graduated college the same year I did, who now works in the private sector, earns about twice as much as I did then. We are all greedy. But for public sector unionized employees, as for MLB players, this is not a zero-sum game. The money a teacher, fireman or policeman makes is part of the tax base that pays for their own salaries, as well as the benefits received by others. Moreover, their disposable income is just as vitally a part of the consumer spending that promotes and supports local business as the dollars spent by private sector employees. Therefore, any attempt to “control” the costs of public employees by destroying their unions may have, at the local level, the unintended side effect of hurting overall consumer spending, which benefits no one. C) We can’t afford them. This argument, that unions will destroy the economy, was an argument that MLB franchise owners made over and over again in the years leading up to the creation of the Baseball Player’s Association, and especially during the dawn of free agency. 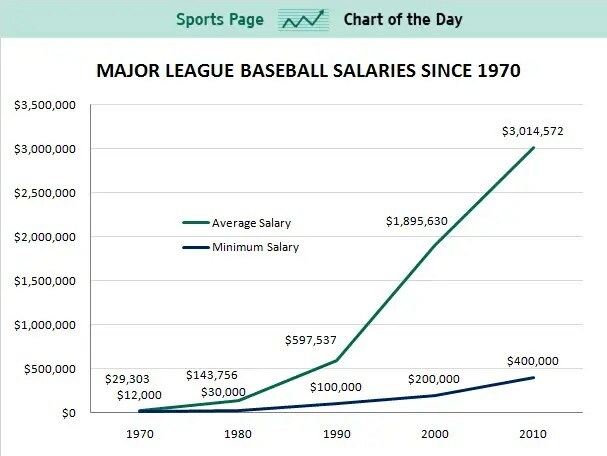 Exploding baseball player salaries will kill the game. Tickets will no longer be affordable, and player greed will kill the goose that laid the golden egg. Also, team owners will be put out of business because they won’t be able to afford these new, extravagant salaries. None of these things came to pass. When George Steinbrenner purchased the Yankees in 1973, he paid just under ten million dollars for the franchise. Estimates are that the Yankees franchise is now worth around three billion dollars. Certainly, not every franchise can boast that same level of economic success, but in the rare occasion when an MLB franchise does go on the market, it rarely lacks a plethora of interested millionaires seeking to purchase it. Moreover, the eight best years of attendance in baseball history have each occurred in the past eight years. Clearly, if you build it, they will come, no matter how much the employees are getting paid. Similarly, beyond the world of baseball, the argument has been made that we can no longer afford unions. Yet many corporations that argue against unionized employees are among the richest companies on earth. Keeping their employees unnecessarily poor may allow them to please their shareholders, but the end result is a two-tiered economy that undermines real economic opportunity, upward mobility, and democracy itself. Even Henry Ford, who was anti-semitic and an early admirer of European fascism, declared that it was right to pay his assembly line workers a fair, living wage if for no other reason than that they should afford to buy the cars they were manufacturing. It should also be noted that in the richest states like Connecticut, Massachusetts and New York, public-sector employee unions have been strong for decades. The strength of those unions did not prevent those states from becoming and remaining wealthy. 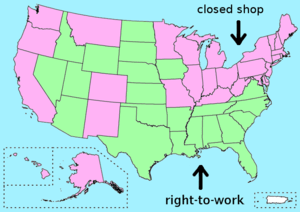 Conversely, many so-called “right to work” anti-union states, especially in the south, have long been among the poorest in the nation. The lack of unions has not, nor will it ever, lift these states out of their second or third-rate economic performances. Yet, counter-intuitively, most of the residents in these same, relatively poor states, harbor negative opinions of unions. The anti-union propaganda machine has long been effective in keeping people poor and ignorant. Thirty or forty years of union decline in this country has not made the nation richer, it has made the middle class poorer. One only has to look at the recent history of Major League baseball to see the obvious solution to this state of affairs isn’t to continue to undermine, even outlaw, the few remaining unions we have left. True, fortunes can be made in the private sector outside of unions. But trends are trends, and in the long run, if current trends continue, there may not be a middle class in the future to enjoy Major League baseball. It will be a game of the few, by the few, for the few. If that day comes, baseball and America will both be greatly diminished. This is a post from Bill over at The On Deck Circle. His primary interest is baseball and periodically he puts the game into real-life terms. Here is one such post. Bill, I really like this post. We share similar views on Unions (I will have 45 years in the IBEW this year) so I am not going to preach to the choir. On one hand Big Biz says that unions are ‘unnecessary’ and on the other hand they spend billion$ trying to destroy them. United we stand! I am going to re-blog this. Thanks. Hi Allan, Unfortunately, they, along with their cronies from both political parties in Congress have done a good job doing just that, destroying them. Perhaps the tide is changing. Let’s hope so. And thanks so much for re-blogging this. Hey Jackson, Thanks so much for the re-blog! Very much appreciated. Super post. I couldn’t have written it better myself. So well researched too. My father worked a union job and he was able to support a family of four kids. My mother managed the house and kids. Now I shake my head and wonder how the heck they did it financially. I also have strong feelings on this. Hey, I’m with you on that 🙂 Maybe we should file for free agency! As far as our dads are concerned, if they had been “lucky” enough to have worked in a so-called “right to work” state, they, and we, would more than likely have grown up in poverty, and would have accepted it as just “normal.” That’s the way it is here in Greenville today. –One of the odd things about Marvin Miller’s legacy is the creation of baseball players as “labor” which, to be frank, is a ludicrous notion, at least as it relates to “labor” in the economic textbook sense. Professional athletes are “talent”, like actors or exceptionally skilled craftsmen and artists. One of the results of the Seitz decision was to make MLB players “talent”, artists who could sell themselves to the highest bidder, like a DeNiro or Cruise. Rightly sensing that owners would be scared shitless of an open marketplace and that the whole of his constituency would be best served by a collective-bargaining agreement, recast ballplayers as “labor.” It was a brilliant idea, a result of Miller knowing the owners better than they knew themselves. It’s not hard to see how he kicked the asses of MLB ownership time and again. –I think that unions, by and large, are neither greedy nor corrupt, and serve as necessary a purpose as ever. I think one way they hurt themselves on the PR front, however, is by embracing an early 20th Century adversarial stance. I think unions should more often embrace the idea of being partners of management rather than sworn enemies, which I think is used against them in the PR battle, and I see that as a significant factor in the rise of the right-to-work movement. Hey, That’s a great point you make about players as “talent” rather than technically as labor. Still, the lesson that a group of men or women in one particular field can organize despite the best efforts of management to stop them, and, therefore, can markedly improve their lot in life, is a lesson that seems to have been largely ignored or forgotten in recent history. I definitely think that labor needs a major P.R. overhaul, but in the face of a vicious and relentless anti-labor agenda that goes back more than a century, the task won’t be easy. Thanks for the insightful comments. I appreciate being made to think a little harder about an issue I think is important. Thank you. You put that perfectly. Another well-written article, Bill, written both through excellent research as well as personal experience. You not only talk the talk; you’ve walked the walk. Glen, Thank you for saying so. I appreciate your kindness. Great post Bill. Very well written and outstanding research as always. But beyond that, kudos for stepping out of the proverbial comfort zone and addressing an issue that cries out for some publicity. Mike, Thank you for saying so. Very interesting article and very creative! I had no idea that baseball players have a union – money talk doesn’t really interest me as much as the game itself. I feel very strongly that, as much as I like the game of baseball, many players (and most professional athletes for that matter) get paid way.too.much. I’m glad there are people who still care about the middle class. You also make a very strong argument for unions! I learned a lot. Thanks! Hi, Normally I don’t get involved in money issues, either. The game itself is what motivates me to write. I appreciate your kind words. Hi, Thank you so much for sharing! Much appreciated. I’m not against unions–as you (and so many others) have pointed out, they’ve made great strides for workers. I think collective bargaining is an aspect of free speech. However, it’s hard to ignore the damage done by certain unions run amok. The problems with the teamsters are well known. The teachers union seems to get stronger every year, while students get increasingly more dim. As you point out, some teachers don’t make great salaries (some do, check out the Chicago public school system), but as the child and grandchild of teachers, I know that the benefits they receive (medical, retirement, etc) are a lot more than most private workers receive, plus they’re hard as hell to fire. I could go on, but I don’t want to give the idea that I’m coming from a certain agenda or that I’ve got an ax to grind. Unions in and of themselves aren’t bad, but their implicit goal of looking out for their members and ONLY their members can make them hard to distinguish at times from a gang. Well, you do raise some good points. When you point out, though, that teachers, for example, receive certain benefits that others in the private sector don’t enjoy, the question shouldn’t be why do they want and receive all these benefits while others who work hard in the private sector don’t? The better question would be, why do so many private sector workers not receive such basic benefits as health care and pensions? And more to the point, why do they / we put up with it? Also, as someone who worked for the Teamsters, I can vouch for the shady dealings they were a part of. At the same time, though, if the Teamsters are getting richer, and the workers have higher salaries than they otherwise would have, and UPS is still doing extremely well, it seems to me that, purely from an economic perspective, more good than harm was done all around. Who were the losers here? Unions can be looked upon as gangs in that they look out for their own. What I don’t quite get, though, is why corporate gangs who look after their own at the expense of others are not vilified in the same way? The big banks and Wall St. financiers who brought this nation to its knees just a few years ago are among the biggest gang of crooks in American history, but not one of them has gone to jail for corruption. For some reason, if you wear a tie and carry a briefcase, you are a legitimate businessman, and always given the benefit of the doubt. But if you come from somewhat less obvious wealth and connections, and demand fair wages and benefits, you are a threat to American capitalism, and, therefore, a gangster. As you can see, my friend, I have strong feelings on the subject. I don’t usually get quite this political, but I get tired of hearing the same old nonsense everyday on T.V., the radio, and the internet. I just thought it was time to push back a little. Thanks for indulging me, my man.